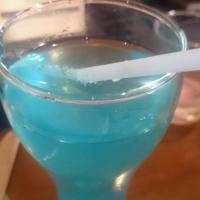 A tryst with Iftaar special at BBQ Nation! This was my first experience with the Amanora one as I have always found myself stuffing those delectable starters over the last 7-8 years at the Kalyani Nagar location. My outing here was refreshing in the sense as every server I saw was with a smile and the usual sense of urgency as visible in popular places like these was missing and for the good for sure 🙂 Hats off to their service that they are able to handle large crowds with so much ease and one hardly feels undeserved! Add to that their fairly relaxed policy on kids (one 6 year old can share with each accompanying adult) and it’s a steal for a Non Veg lunch any day from Monday to Saturday for 630 per person AI. Too many buffet places these days fully charge the kids from 4 years onwards and it’s so disappointing and total wastage of money as I am not sure who are those 4 year olds that can eat as much as an adult so why pay that price? Ambience wise it’s fairly alright if somewhat cramped for space at some places but the outdoor seating is definitely a plus during cooler days. 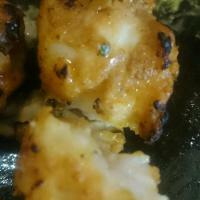 Talking about the food that day, stars of the show were Fish tikka, Tandoori chicken, prawns, mushrooms, Matar paalak ki tikki and special mention for mutton seekh kebab. 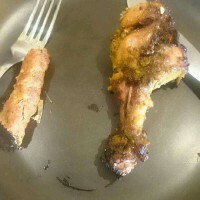 The mutton seekh kebab was not the usual piece of wood that Bbq Nation almost always serves and which I so much dislike but it was surprisingly soft and had nice flavor to it. It wasn’t quite still the melt in the mouth types but a vast improvement from before. This was in a variant of gilafi seekh as part of their Iftaar menu and was quite good. Other Iftaar specials like Haleem (awful), saivaiyaan(3/5), Nihari (3.5/5) didn’t quite live upto the expectations of their special menu and I believe they should have been much better. As usual the Pacific blue Mocktail was quite good and the roohafza in milk was strictly Ok and didn’t quite deserve to be served as a special Iftaar menu item. Main course was fairly ok and I would rate it as 3.5/5, I could have rated them at 4 if it wasn’t for their Biryani goof up. The chicken Biryani was as dry and tasteless as you wouldn’t want your Biryani to be and it was the deal breaker for me in Main course. I have had 10 times better Biryanis in Bbq Nation before and I hope this was a one off case. 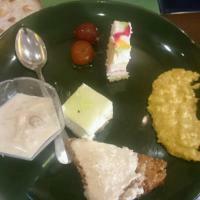 Desserts were pretty good and a special Kulfi counter was the star here. 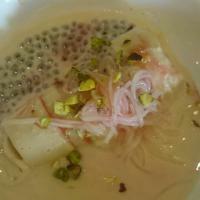 One could order 6 types of Kulfi combination with falooda, different types of sprinkles and flavors. This was a welcome change from their usual desserts fare and we liked it very much.